Dit Da Jow – First aid to help prevent the risk of skin infection in minor cuts, scrapes, burns. Used topically for muscle, bone, joint injuries, sports-related injuries, bruises. First aid to help prevent the risk of skin infection in minor cuts, scrapes, burns. Used topically for muscle, bone, joint injuries, sports-related injuries, bruises. 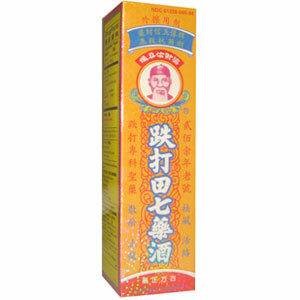 Stop pain, reduce swelling and inflammation and disperse stagnant Qi and promote blood circulation. Skin infection in minor cuts, scrapes, burns. Muscle, bone, joint injuries, sports-related injuries, bruises. Clean the affected area. Apply a small amount on the area 1 to 3 times daily. May be covered with a sterile bandage. If bandaged, let dry first. For external use only. Do not use in eyes or over large areas of the body. Ask a doctor before use if you have deep or puncture wounds, animal bites, serious burns. Stop and ask a doctor if condition worsens, infection occurs, or if condition persists for more than 7 days, or if there is redness, swelling or pain persists or increases. Stop use and consult a doctor if you experience nausea, vomiting, abdominal discomfort, diarrhea or skin rash. Keep this and all drugs out of reach of children. In case of accidental ingestion, seek professional assistance or contact a poison control center immediately. Flammable. Do not use near open flame. If you are pregnant or nursing, seek the advice of a health professional before using this product.